After work, I picked up Tristan and brought him with me to pick up my scentsy stuff! My home smells so wonderful now! If you don't know what scentsy is check out this site. It is a wickless candle. The scents available are so yummy and pleasing. They sell it via hosting parties, like Pampered Chef, Creative Memories, Mary Kay, etc. I had never heard of it before, but it is such a great product and so much safer than burning candles in your home. Then, one by one, he'd have to flip the other cards until he found a match. Okay, so it wasn't as smooth as it sounds. He constantly forgot to turn a card back upside-down before looking at another, he kept mixing up the cards and not putting them back neatly (I know, I'm being picky). 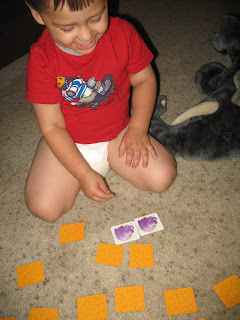 I only grabbed about 20 cards or so for him to try, which was plenty. 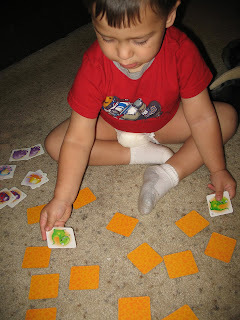 He kept flipping over the same ones thinking somehow they had changed to be the card he needed. 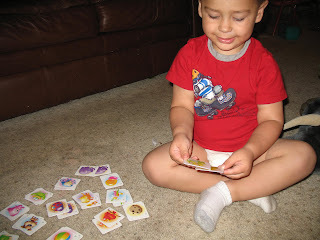 Tristan was excited every time he got a set of matching cards. He knows the concept of same and different, he just doesn't associate the terms "same" and "different" with the concept. Now, how do I get him to understand those words? As for the memory portion of the game, there were only a couple of times in which he realized he had seen the card before. And a few of those times, he'd start flipping cards in the same vicinity of where he remember it had been. I think that if we play this a few times a week, he'll eventually get the concept down. Anyway, here are some pictures of Tristan enjoying the game. Please excuse his pant-less self. He spilled on his pants and since it was so close to bedtime, I didn't bother putting him in new ones. Elephants! What an exciting match for Tristan - he loves elephants. Look a dinosaur! Two dinosaurs! Our final match! Good job kiddo!